"THE U.S. ARMY AT WAR 1944/45"
"THE BATTLE OF HONG KONG 1941"
"ON THE STREETS OF BERLIN"
And suddenly… before you know it… it’s almost the end of the year and Christmas will soon be upon us! To be honest it’s also my favourite time of the year... I’m fortunate to get to go to Europe at this point and meet many of our most enthusiastic collectors and dealers at events and shows in Italy, France and the U.K.
What delights and amazes me is the huge amount of background knowledge these collectors have… about both the hobby in general and K&C in particular. 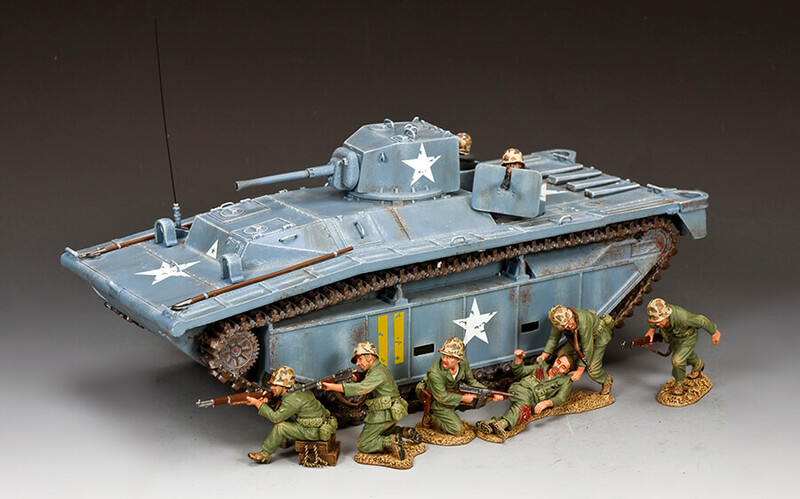 PLUS I’m fortunate to get a wealth of great ideas and suggestions from those very same collectors and dealers that often turn into some of the most popular and best-selling K&C figures, fighting vehicles and aircraft! A very Merry Christmas and a Happy, healthy and prosperous New Year! 1. "THE U.S. ARMY AT WAR 1944/45"
Our 2nd batch of ‘Fighting GI’s’ from the latter days of WW2 add some extra firepower in the shape of TWO MORE Riflemen… a ‘Bazooka Guy’ and a kneeling, shouting ‘Tommy- Gunner’… All dressed for battle in the ETO (European Theatre of Operations) during 1944/45. 2. "THE BATTLE OF HONG KONG 1941"
During the Second World War, the British Crown Colony of Hong Kong was destined to be the first place the Canadian Army fought a land battle against the Axis powers. On December 8, 1941, 2 x battalions of Canadians, The Winnipeg Grenadiers and The Royal Rifles of Canada were an important part of the British garrison defending Hong Kong against a Japanese attack. Just hours after simultaneous Japanese attacks on Pearl Harbor, Malaya, Singapore and the Philippines the enemy struck. Within 5 days they had occupied all of the New Territories (bordering mainland China) and the Kowloon Peninsula. Now they were poised to invade Hong Kong Island itself! On 19 December, the second day of fighting after the Japanese had landed on Hong Kong Island, soldiers of “A” Company, Winnipeg Grenadiers were holding defensive positions in the centre of the Island. Japanese troops had surrounded the ‘Winnipeggers’ and were lobbing grenades into the Canadian position. On numerous occasions, Company Sergeant Major John Osborn, a WW1 veteran, picked them up and threw them back at the enemy. When one fell where Osborn could not reach it in time, he shouted a warning to his men and threw himself onto the grenade smothering the explosion. He was killed instantly but his sacrifice saved the lives of many of his men. CSM Osborn was posthumously awarded the Victoria Cross, Britain’s highest military award for bravery in the field. FOB154 "Taking The Fight To The Enemy"
CSM John Osborn V.C. leads 3 of his Winnipeg Grenadiers into battle. In one hand he holds his ‘Tommy-Gun’, in the other a grenade. All 3 infantrymen carry the standard British .303 Lee Enfield Rifle. As the Bren Gunner moves forward his ‘Number 2’ provides covering fire. Further Reading: A great book on the Battle of Hong Kong is Oliver Lindsay’s “The Lasting Honour”… Highly recommended! 3. "HONG KONG IN PEACETIME"
HK268G "Standing Coolie w/ Water Baskets (Gloss)"
In those far off days there was little or no indoor water supply so most people had to go to a nearby fountain or well to collect fresh water using a wooden bucket like the one shown. Here, the lady is about to fill up her bucket. HK268M "Standing Coolie w/ Water Baskets (Matt)"
As we all know there is nothing more enjoyable than watching other people work. 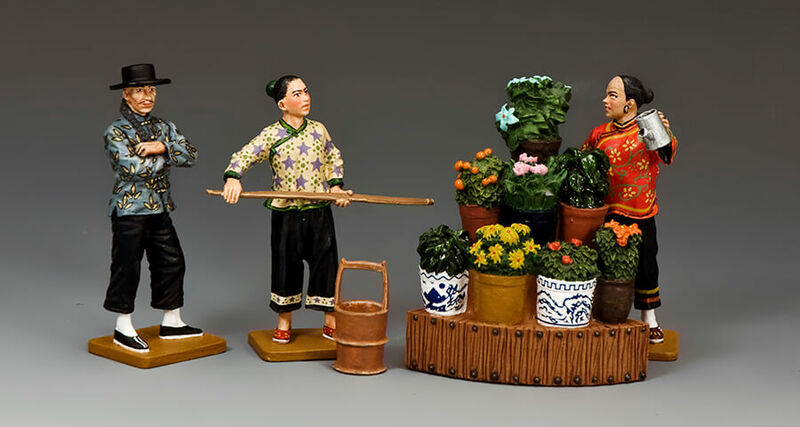 Here, this Chinese gentleman stands, arms folded, observing others hard-at-work. HK279G "The Flower Stall Set (Gloss)"
HK279M "The Flower Stall Set (Matt)"
When we launched this ‘TARAWA’ range of U.S. Marines at the recent Chicago Show (September 2017) little did we realize just how popular they would become!!! This is the THIRD Amtrack K&C has produced over the years and the FIRST to carry the turret-mounted 37mm gun from the M3 Light Tank. In addition to the main gun this amphibious vehicle has TWO Marine-manned .30 caliber machine guns as part of its defensive/ offensive armament. A sitting (on ammunition crates) Marine taking careful aim with his M1 ‘Garand’ Rifle. With both knees ‘on the deck’ this Leatherneck opens fire with his Browning Automatic Rifle. A running Marine sprints for cover as the bullets fly around him. 5. "ON THE STREETS OF BERLIN"
A Berlin ‘tough-guy’ and petty criminal... his star rose rapidly in the SA (Sturmabteilung) and he became well-known to the Police, fellow comrades of the SA and, of course, to his enemies, the Communists. In February 1930 his enemies caught up with him and he was shot by two left wing assassins. After his death he was promoted by Josef Goebbels, Berlin’s Gauleiter, as a ‘martyr’ to the Nazi cause and celebrated in words and music by a specially composed song “The Horst Wessel Lied” which during the Nazi years became almost a second National Anthem to “Deutschland Uber Allies” (Germany Above All). Here, Wessel strides confidently forward, right hand adopting the ‘half-Hitler’ salute favoured by some Nazi Leaders and their acolytes. 6. "DOWN AMONG THE PEASANTS"
As regular collectors know K&C has produced a great number of Soviet armoured vehicles and Red Army figures. 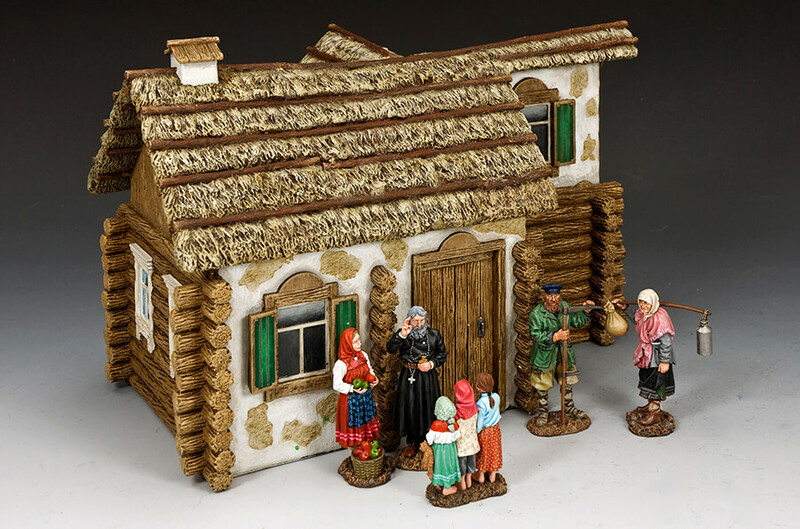 SP097 "The Russian Farm House"
This typical wooden structure features TWO different sides to the building allowing collectors to reverse sides to crate alternative displays as well as, if you buy 2, to create a small two-building settlement somewhere out on the Russian Steppes. 7. "STREET FIGHTING PANZER GRENADIERS"
As the war lengthened and Germany weakened important changes were made to the ‘look’ of the German soldier himself. 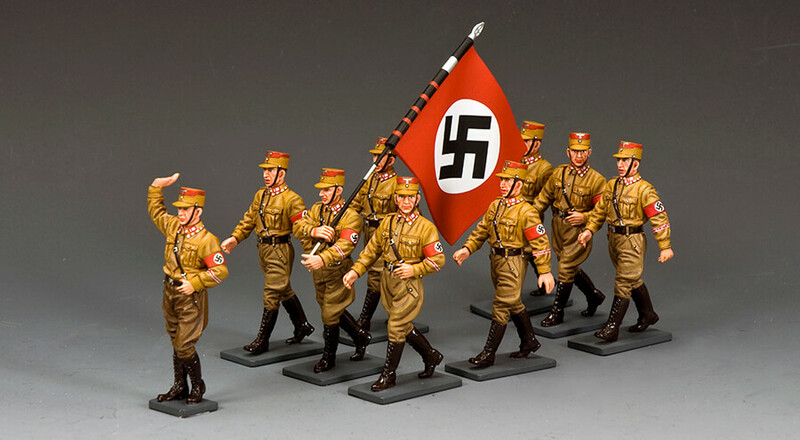 Due to clothing and material shortages the German Army began to copy some of the ideas from their enemies… these Panzer Grenadiers are ample proof of that. Gone are the high, traditional jackboots, replaced by short ankle boots and web-style gaiters (copied from the British). The uniform jacket also became shorter and waistlength (again an influence borrowed from British battledress). The Germans were pioneers of these rocket-propelled, anti tank grenades and many an Allied vehicle fell victim to their accuracy and lethality. WH079 "Kneeling Panzer Grenadier with Schmeisser"
Another German favourite... the soldier with the MP40 machine pistol. WH080 "Standing Firing Panzer Grenadier"
This Panzer Grenadier is armed with the standard German rifle of WW2... The Mauser K98, a bolt-action rifle firing the 7.92mm cartridge. First issued in 1935 it saw continuous action until the end of the war in 1945. WH082 "The Sniper Team (2 figures)"
Our sniper here is firing the “Gewehr 43” a semi automatic rifle that owes some of its development to the earlier Soviet ‘Tokarev SVT-40’. It fired the same 7.92mm round as the K98 and had a 10-round box magazine. Kneeling alongside our sniper is his ‘Spotter’ observing the enemy and selecting targets. 8. "BEING RETIRED THIS MONTH..."
A great little display item with lots of detail that can be used primarily in an Ancient Egypt" scenario... or just as well with "Napoleon in Egypt" figures or even WW2's Afrika Korps or 8th Army. " A pair of greatcoat-clad soldaten" perfect for guarding a strong-point, a bridge crossing or anything you like. One carries the obsolete (but still used) Bergmann submachine gun ." DD274 "The M36 'Jackson' Tank Destroyer"
Developed towards the end of WW2 the M36 “Jackson” was the most powerful U.S. tank destroyer of its time mounting a massive 90mm gun. It replaced the much weaker M10 which only carried a 76mm gun. Supplies of the M36 finally began to arrive in the European Theatre of Operations in September 1944 where it immediately proved itself to be more than a match against any of the heavy tanks of the Germans. It also saw ‘active duty’ in the Korean conflict easily defeating the Russian-supplied armour used by both the North Koreans and the Chinese Red Army. Even after Korea, M36’s turned up in the former Yugoslavia and saw action in the 1990’s! Our K&C M36 is painted in typical olive drab finish complete with Allied ‘white star’ and would have certainly took part in The Battle of the Bulge in December ’44 and the drive into Germany in the first 5 months of 1945. Sepp Dietrich in a new parade" pose." A fashionable young lady and popular with the gentlemen. And highly popular it proved to be as it quickly sold out ! More than a few collectors however requested that “Karl Otto” should also be released as an individual figure so that he could be used with other K&C German tanks... Well, here he is... minus his Tiger! SAF001 "Singapore Commando on Parade"
The Singapore Armed Forces may be relatively small in numbers but they are highly professional, well motivated and extremely well-equipped and trained. In addition to the “Regular” full-time soldiers, sailors and airmen ... Singapore has ‘National Service’ for all male Singaporeans over the age of 18. Upon ‘Call-Up’ young Singaporeans will either be directed to the Singapore Armed Forces (SAF), the Singapore Police Force (SPF) or the Singapore Civil Defence Force (SCDF). The vast majority go to the SAF. Within the SAF the best and most elite unit is the Singapore Commando Formation. A battalion-sized unit that specializes in reconnaissance and preemptive operations in small groups within enemy territory. 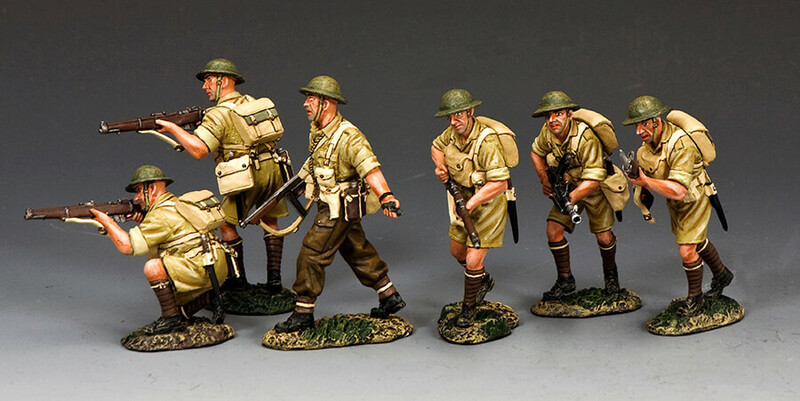 Our special Singapore event figure portrays a soldier of the Commando Formation in NO. 1 Dress uniform complete with Red Beret and carrying his SAR21, the 5.56mm Assault Rifle, Singapore designed and manufactured weapon with fixed bayonet. And that’s the story for December… Let’s hope there’s more than a few K&C things for you under your Christmas Tree this Festive Season! Best wishes and... Happy Collecting!